# The roominess of it all. # The idle time while standing upright. # Month-old episodes of 60 Minutes. # The comforting feeling of being in complete control. # Watching someone attempt to close the overhead bin at least 15 times before giving up and letting the attendant deal with it. About an hour into the flight to London from Boston, I spilled a full glass of cranberry juice in my lap. There are several reasons why this was unpleasant, and they all include the words “embarrassed”, “sticky” and “no, I didn’t just pee my pants”. I’ve now returned from @media on Father’s Day. It was a great trip despite the soggy flight out, and it’s really good to be back home with the family. Many thanks to Patrick for inviting me to speak. I think it went just fine, and I especially enjoyed the questions at the end of the talk. We watched England win the World Cup match the previous night, so I knew there’d at least be smiling faces in the audience. For those that attended the session, I’ve posted the presentation slides (20MB PDF). Warning: they won’t be of much use without the commentary. It’s always fun meeting new faces for the first time at these conferences, and @media was no exception. It’s the genuine friendliness of the people in this community that never seems to wear out. Fun times are a given. Wish I had the time/energy to list them all here, but it’s late. I also wish I had taken more photos, but what I did take are now up on Flickr. *Update:* I forgot to mention, I successfully spent the torn note at a hotel pub after the @media party. Either my taping job was superb, or it was dark enough to go unnoticeable. Whew. 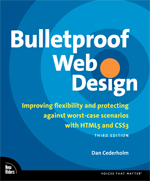 Tomorrow night I’ll board a plane for London, where I’ll be presenting Bulletproof Web Design on the second day of @media 2006. I’m pretty excited about the trip, depite being terrified of leaving Jack and Kerry. They’ll be fine, of course. But it feels weird to be leaving, even though I haven’t left yet. Anyhow, it’ll be great to see some friends I haven’t seen in a long while, and I’m really looking forward to meeting new ones. I don’t get out much these days. If you’re heading to the conference, be sure to say “hi”. Coincidentally, my talk is the first of the morning after the England vs. Trinadad & Tobago World Cup match. Will anyone show up if they win? If they lose? Will I get swept up into all of this? Probably. And then my session should be even more interesting. Also, for the past eight years I’ve been carrying around a British £5 note in my wallet from our first trip to England. I have fond memories of the trip, where Kerry and I (not yet married at the time) visited my parents who were staying in Oxford for the summer. My grandfather (on my Dad’s side) made the trip out with us, and I can remember we tired him out with walking tours of Oxford, London and the Cotswolds. I’d been saving this 5 pounds for the day I returned to the UK, to plunk it down in a pub, and tip my glass to my late grandfather, and the great memories of our first trip to Europe. Last week, while cleaning out my wallet of old receipts, I accidentally ripped the £5 note into four pieces along with the unwanted receipts. Argh. I’ve taped it back together, and just hope it’ll be accepted somewhere. For eight years, it’s happily lived in my wallet (several wallets, actually), and then I had to go and do this, just a week before returning. Ah well. While working on Cork’d, I realized this was a perfectly fine excuse to implement some microformats. What goes great with a nice 2003 Pinot Noir? Meaningful markup, naturally. Our implementations aren’t perfect, but it’s a start. The rest of this article will talk about how we implemented hReview for member-entered tasting notes (example) and specifically how I used CSS to style the markup.